Overdiagnosis of breast cancer due to mammography screening, defined as thediagnosis of screen-detected cancers that would not have presented clinically in awomen's lifetime in the absence of screening, has emerged as a highly contentiousissue, as harm caused may question the benefit of mammographic screening. Moststudies included women over 50 years old and little information is available foryounger women. We estimated the overdiagnosis of breast cancer due to screening in women aged 40to 49 years using data from a randomised trial of annual mammographic screeningstarting at age 40 conducted in the UK. A six-state Markov model was constructedto estimate the sensitivity of mammography for invasive and in situ breast cancer and the screen-detectable mean sojourn time fornon-progressive in situ, progressive in situ, and invasivebreast cancer. Then, a 10-state simulation model of cancer progression, screening,and death, was developed to estimate overdiagnosis attributable to screening. The sensitivity of mammography for invasive and in situ breast cancerswas 90% (95% CI, 72 to 99) and 82% (43 to 99), respectively. The screen-detectablemean sojourn time of preclinical non-progressive and progressive in situ cancers was 1.3 (0.4 to 3.4) and 0.11 (0.05 to 0.19) years, respectively, and0.8 years (0.6 to 1.2) for preclinical invasive breast cancer. The proportion ofscreen-detected in situ cancers that were non-progressive was 55% (25 to77) for the first and 40% (22 to 60) for subsequent screens. In our main analysis,overdiagnosis was estimated as 0.7% of screen-detected cancers. A sensitivityanalysis, covering a wide range of alternative scenarios, yielded a range of 0.5%to 2.9%. Although a high proportion of screen-detected in situ cancers werenon-progressive, a majority of these would have presented clinically in theabsence of screening. The extent of overdiagnosis due to screening in women aged40 to 49 was small. Results also suggest annual screening is most suitable forwomen aged 40 to 49 in the United Kingdom due to short cancer sojourn times. Since the introduction of mammography screening in many countries, a substantialincrease in the incidence of breast cancers has been observed, raising concern about thepotential for overdiagnosis of breast cancer due to screening. However, no consensus hasbeen reached on the extent of such overdiagnosis. An overdiagnosed breast cancer isdefined as one which is screen-detected, and would never have presented clinically in awoman's lifetime in the absence of screening . In addition to overdiagnosis and consequent overtreatment, screening resultsin additional years lived with breast cancer due to the advancement of time ofdiagnosis. Estimates of overdiagnosis in previous studies vary considerably. Comparisonsof expected breast cancer incidence extrapolated from rates before the introduction ofscreening with that observed after have resulted in estimates of overdiagnosis rangingfrom 4%  to 52%  of all diagnosed breast cancers. Variations between estimates reflect themethodological challenges faced when estimating overdiagnosis. A drop in breast cancerincidence is observed in the age group immediately above that invited for screening dueto the advancement of diagnosis of these cases by screening. Studies that do not accountfor this compensatory drop tend to have a higher estimate of overdiagnosis. Estimateswill also vary depending on whether or not in situ cancers are included [1, 4]. Simulation modelling is a popular tool for estimating the extent of overdiagnosis due toscreening; it requires estimates of the mean duration of pre clinical cancer states(mean sojourn time), the screening test sensitivity (STS), and the background incidenceof breast cancer in the absence of screening. De Koning et al. applied this approach to Dutch screening data for women aged 50 to 74, andestimated that 3% of all cancers and 8% of screen-detected cancers were overdiagnosed . Most estimates of overdiagnosis are based on data for women aged 50 years and over, asyounger women are currently not eligible for screening in most countries. The extensionof the age range of screening programmes to include younger women is under debate, butlittle is known on the extent of overdiagnosis due to screening in these women. Also,evidence suggest that younger women tend to have breast cancers that progress faster andlower mammography STS, mostly due to higher breast density, than older women [6–9], which may be favourable with regards to overdiagnosis. the proportion of breast cancers diagnosed that would not have presented clinically in the absence of screening after accounting for a compensatory drop in incidence. Details of the Age trial are given elsewhere . In summary, a randomised controlled trial was designed to assess theeffectiveness of annual screening by mammography in women from age 40 onwards in theUK. The trial comprised of an intervention arm of 53,890 women assigned to annualscreening invitation and a control arm of 106,971 women not offered screening.Recruitment began in 1991 and the trial included 23 centres. Women were invited eachyear, except for those who specified that they did not wish to participate in thetrial. Two-view mammography was performed on the first attendance to screening. Thefollowing screens were single view unless otherwise indicated. All diagnosed breastcancers, including interval, screen-detected, and those in the control arm, wererecorded and submitted to a pathologic review. Women with diagnosed breast cancer at entry to the trial were excluded from thisanalysis. Out of the 53,890 women assigned to the intervention arm, 36,348 attendedthe first screen and were eligible for analysis. For each following screen, womenwere included only if they attended all previous screening rounds. Only screeningepisodes recorded from ages 40 to 49 years as part of the trial were considered, andthe analysis was limited to the first eight screening invitations since few womenreceived more than this number. The exact date of each screen and of any breastcancer diagnosis was known for each woman. Interval cancers were defined as cancersdiagnosed up to 12 months after a negative routine screen, and time since theprevious negative screen was calculated in months. In all eight screening rounds, atotal of 194 screen-detected, and 122 interval cancers were recorded. The numbers ofwomen screened, and of screen-detected and interval cancers in each screening roundare presented for in situ and invasive cancers in Table 1. Cancer detection by screening round in a trial of annual mammographic screeningstarting age 40, UK. 1Only includes women screened at all previous rounds;2interval cancer; 3invasive carcinomas;4in-situ carcinomas. The Age trial is registered as an International Standard Randomised Controlled Trial,number 24647151. Ethical approval was obtained for the trial from London MREC(MREC/98/2/40), and NGIB (formerly PIAG) approval (PIAG 3-07(h)/2002) was obtainedfor the use of identifiable patient information. We constructed two Markov models to estimate the extent of overdiagnosis (Figure1): one to estimate screening parameters based on the Agetrial data (parameter estimation model), and one to estimate overdiagnosis based onparameter estimates from the first model (overdiagnosis model). Graphical respesentation of a six-state parameter estimation model and a10-state overdiagnosis model. 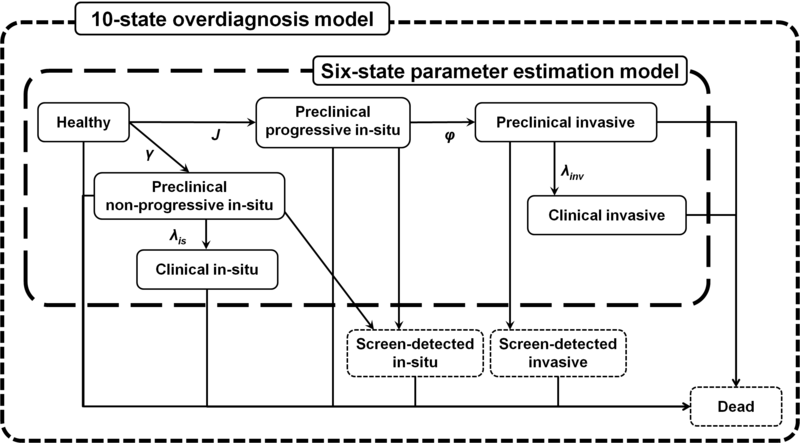 This figure shows states included in theparameter estimation model, a six-state Markov model of breast cancerprogression for estimating screening parameters including screening testsensitivity and mean sojourn time, and the overdiagnosis model, an extended10-state model aimed at estimating the extent of overdiagnosis. Dotted statesare those added in the extension from the former to the latter model. Thescreen-detected in situ state groups two distinct states:screen-detected progressive and non-progressive in situ. We constructed a six-state Markov model similar to that in a previous study ; states included were healthy, screen-detectable non-progressive insitu (NPIS), clinically diagnosed non-progressive in situ (CIS),screen-detectable progressive in situ (PIS), screen-detectablepreclinical invasive breast cancer (PIBC), and clinically diagnosed invasivebreast cancer (CIBC). Several important assumptions were made on the natural history of breast cancer inorder to simplify the model specification. First, we assumed that there were twotypes of in situ lesions: one that would progress into invasive cancer,and another that would never progress into invasive cancer, but could becomeclinically detected in the absence of screening. Thus, PIS would not be diagnosedin the absence of screening and would eventually progress into PIBC beforebecoming clinically diagnosed. Also, in situ cancers detected atscreening would be either from PIS or NPIS, whereas those observed in thescreening interval or in the absence of screening would be exclusively from NPIS.Second, we assumed that all PIBC have a mandatory PIS precursor. Finally, weassumed that preclinical cancers could not regress, but only remain in theircurrent state or progress. Q = S T A T E 1 Healthy 2 NPIS 3 PIS 4 PIBC 5 CIBC 6 CIS 1 2 3 4 5 6 - ( γ + J ) γ J 0 0 0 0 - λ i s 0 0 0 λ i s 0 0 - ϕ ϕ 0 0 0 0 0 - λ i n v λ i n v 0 0 0 0 0 0 0 0 0 0 0 0 0 . Both J and γ were obtained directly from the observedage-specific incidence in the control arm of the Age trial who were not offeredany screening between the ages of 40 to 49 years. Given the assumption ofexponential distribution of time to transition, the MST in a state was the inverseof the transition rate. From the intensity matrix, the probability of progressionfrom any state i to any state j in any time interval t,can be defined as P ij (t). The derivation oftransition probabilities is based on the solution of Kolmogorov equations andexponential distribution properties and will not be developed here [11–13]. Given transition probabilities, P ij (t),the probability of having a positive or negative mammogram, as well as theincidence of breast cancer in the interval between two screens can be formulated(Table 2). Probability of cancer detection at prevalent and incident screens, andmonthly incidence of interval cancers. Age, age at first screen; NPIS, non-progressive in situ breastcancer; PIBC, preclinical invasive breast cancer; PIS, progressive insitu breast cancerl; t, screening interval. Women in this analysis were free from diagnosed breast cancer at entry, meaningthat, at the prevalent screen, probabilities were conditional on being healthy orin a preclinical disease state. The number of women screened in each round,n.scr k , is given in Table 1. The STS for in situ andinvasive cancer were defined as S is and S inv , respectively. In each screen, we defined the probability of screendetection of NPIS, PIS, and PIBC. 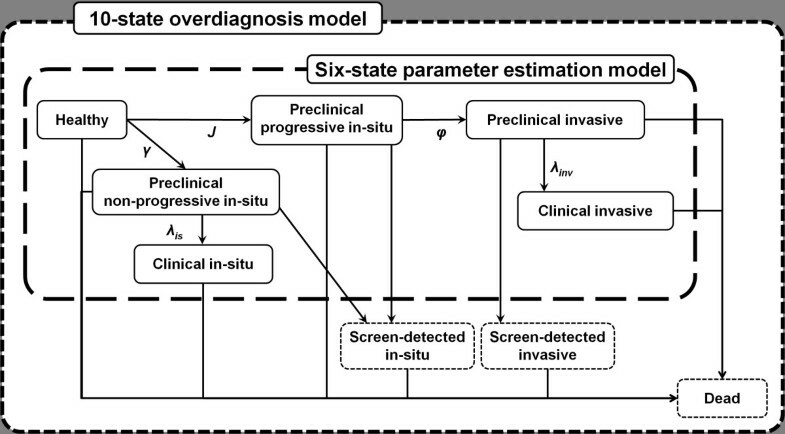 The model was fitted to the observed number ofin situ and invasive cancers detected in each screen. For incidentscreens, we defined the probability of having a false negative result in theprevious screen for each preclinical cancer state. The monthly incidence ofinterval cancers was defined for CIS and CIBC and fitted to the observed incidenceof in situ and invasive cancers, respectively, in the first 12 monthsafter each screen. This analysis was performed using WinBUGS14. The median and 95%credible interval (CI) of the posterior distribution for each parameter wasobtained through Gibbs sampling, using 5 chains of 3000 iterations. Due to theircorrelated nature, we also estimated the correlation between MST and STS. The first model was extended to include 10 states in order to estimate the absoluteamount of overdiagnosis due to screening (Figure 1). Statesincluded healthy, preclinical NPIS, preclinical PIS, PIBC, screen-detected NPIS,screen-detected PIS, CIS, screen-detected PIBC, CIBC, and dead. In the simulation,1,000,000 women were followed up for 15 years in monthly cycles starting from age 40.Transitions probabilities between states were calculated using data from varioussources: (1) the Office for National Statistics (ONS), for the incidence of invasiveand in situ breast cancer  and all-cause death rates  in women aged 40 to 54 from 2008, (2) the Age trial , for the incidence of invasive and in situ breast cancer in womenaged 40 to 49, (3) the parameter estimation model in this study, for the STS and MSTin pre-cancer states in women aged 40 to 49, and (4) estimates from previous studies [7, 8, 11] for the MST in women aged over 50. For the breast cancer incidence inwomen aged 40 to 44, we used incidence rates reported by ONS. For women aged 44 to49, ONS incidence rates are affected by screening at age 49; we therefore used theincidence in the control arm of the Age trial, adjusted by the ratio of the ONS ratesto Age trial rates for the 40 to 44 age group. This resulted in higher incidencerates than those observed in the Age trial control arm; it was therefore notnecessary to adjust these rates for selection bias due to the lower observed rate innon-attenders. For the base-case analysis, the medians of our MST and STS estimateswere used. We also performed sensitivity analyses to investigate the impact ofchanging MST and STS on the estimate of overdiagnosis. We considered the followingscenarios: high MST, low MST, high STS, low STS, high MST with low STS, and high MSTwith high STS (Table 3). This analysis was performed usingTreeAge Pro 2011 (TreeAge Software Inc., Williamstown, MA, USA). Parameter definitions for base-case and sensitivity analyses of overdiagnosismodel. 1,2,3Refers to the median, upper limit, and lower limit of resultsfrom parameter estimation model, respectively. MST, median sojourn time; NPIC,non-progressive in situ; PIBC, preclinical invasive breast cancer; PIS,preclinical progressive in situ. Estimates from the parameter estimation model are shown in Table 4. The median and 95% CI for the invasive and in situ mammography STSwere 90.0% (72.0 to 98.9) and 81.7% (43.4 to 99.0), respectively. Model estimates forthe MST in the screen-detectable PIBC state was 0.84 years (0.64 to 1.21), which, addedto the MST in the screen-detectable PIS state, 0.11 years (0.05 to 0.19), gave a meanwindow of 0.95 years for a cancer to be detected via screening before arisingclinically. For screen-detectable NPIS, the MST was 1.29 years (0.41 to 3.44). Theestimated proportion of screen-detected in situ cancers that werenon-progressive was 55% (25-77) in the prevalent and 40% (22 to 60) in incidentscreens. Results of the overdiagnosis model are given in Table 5. In ourbase-case analysis, 16,030 breast cancers were diagnosed between the ages of 40 and 49years in women offered screening, in contrast with 15,425 in women not offered anyscreening, a surplus of 605 cases, equivalent to 6.2% of screen-detected and 3.8% of allcases. However, in ages 50 to 54, where screening is not offered in both simlulatedgroups, 541 additional cases were diagnosed in women not offered screening previously,resulting in a total of 64 overdiagnosed cases equivalent to 0.7% of screen-detectedcases and 0.4% of all cancers diagnosed within ages 40 to 49 years. Comparison of the number of cancers detected for 1,000,000 women in annualscreening between ages 40 to 49 years versus no screening versus. Estimates from the overdiagnosis model. Estimates of overdiagnosis in our sensitivity analysis ranged from 0.5 to 2.9% ofscreen-detected cancers and 0.3% to 2.2% of all cancers diagnosed within ages 40 to 49years. The highest impact on overdiagnosis was observed when increasing the MST, whereasincreasing the STS had a smaller impact on overdiagnosis (Table 6). Overdiagnosis of breast cancer due to annual screening in women aged 40 to 49years. When compared to data from the Age trial, the parameter estimation model accuratelypredicted the screen-detected invasive cancers for the first six screens, butunderestimated those for the last two screens (Table 7). Forscreen-detected in situ cancers, model predictions were accurate for thefirst five screens, but underestimated the observed number for the last threescreens. The number of invasive interval cancers were overestimated for the firstscreen, and underestimated in the last three screens. The expected number of insitu interval cancers were underestimated for the last screen only. For allscreens combined, the model slightly underestimated the number of screen-detectedinvasive cancers. Expected values from the overdiagnosis models were within the rangeof estimates from the parameter estimation model, and had a similar fit to theobserved data in the intervention arm. The fit of the expected numbers of cancers inthe control arm was good, with a slight overprediction overall of approximately2%. Fit of model estimates to data observed in a trial of annual mammographicscreening starting age 40 in the UK. 1The parameter estimation model was built using the incidence in thecontrol arm. In this study, we aimed to quantify the overdiagnosis of breast cancer attributable toscreening women aged 40 to 49 years annually by first estimating screening parameters ina six-state Markov model using data from a trial of annual mammographic screeningstarting age 40 conducted in the UK. In women aged 40 to 49 years in the UK, weestimated that only 0.3% to 2.2% of all cancers were overdiagnosed. An implicit assumption of the Markov process is that the time to transition isdistributed exponentially. This distribution has been used in many instances previouslyand has been shown to have a good fit to progression models for breast cancer, as wellas other cancers [11, 12, 16]. We assumed that all in situ cancers that arose in the absence ofscreening were non-progressive. In reality, a proportion of in situ casesdetected in the absence of screening may be progressive. However, this proportion couldnot be estimated when relaxing this assumption. Estimates from our overdiagnosis model suggest a 5% reduction in the detection ofinvasive cancers as a result of screening. Previously, three screening trials (theTwo-County, Stockholm, and Goteborg trials) showed a non-significant reduction of 5% to10% in the incidence of invasive breast cancer when comparing the incidence in thescreened and control groups . Also, we assumed that all invasive cancers had an in situ precursor, which may not be the case . Hence, our model may have overestimated the number of invasive cancersdetected in their in situ precursor state. However, it is unlikely that thiswould affect our estimates of overdiagnosis as both in situ and invasive breastcancers were included in our calculations. Our results showed that the STS for in situ cancers was approximately 10% lowerthan for invasive cancers, probably due to the larger size of invasive tumours . Although no previous studies estimated the STS of in situ cancersseparately, previous estimates of the STS for preclinical breast cancer ranged from 69%to 100% [6–8, 13], consistent with our 90% STS estimate for PIBC. In the Age trial, two-viewmammograms were performed at prevalence screen, and one-view at incident screens unlessindicated otherwise. When estimated separately, we found a 10% difference in prevalent(95%, 79 to 100) and incident STS (85%, 69 to 95). However, this model did not show anyimprovement in fit, and could not estimate the difference in STS for in situ and invasive breast cancer, which are more important parameters with regards tooverdiagnosis due to screening. In addition, the STS of mammography is likely toincrease with increasing age ; it was not possible to incorporate this in the current model, but oursensitivity analysis found that increasing the sensitivity had limited impact on theestimate of overdiagnosis. Estimates of MST and STS are necessarily related. Thecorrelation between STS and MST in our model was 0.75 and their distribution showed nosign of bimodality. The sensitivity analysis addressed the correlated nature of STS andMST, by the inclusion of a scenario with long MST and small STS as an alternative to ourbase-case model, which had short MST and high STS. The MST for screen-detectable NPIS was the longest among pre-cancer states, suggestingthat more NPIS are detected in the prevalent screen than in incident screens. Forscreen-detectable PIS, the MST was very short, roughly three to ten weeks. Being muchshorter than the yearly screening interval, this implies that few progressive lesionsare detected in the in situ stage. However, the pool of progressive lesionswill renew itself at each screen, implying that the rate of progressive lesions detectedat each screen is constant proportionally to the background incidence of invasive breastcancer. According to our estimates, the combined MST of PIS and PIBC was under one yearin 66% of cases. This would support annual screening for women aged 40 to 49. Biennialor triennial screening would result in many women developing both pre-cancer and havinga clinical diagnosis during the screening interval. To our knowledge, only one study used a six-state Markov model to estimate the detectionrates of NPIS in screening, but did not estimate STS . Using UK data for women aged 50 and over, authors predicted that 39% and 21%of screen-detected in situ cancers were non-progressive at prevalent andincident screens, respectively. The model had a lack of fit for UK data, overestimatingcancers detected at prevalent and underestimating cancers detected at incident screens.In this study, we predicted a higher proportion of NPIS, possibly due to a higherrelative background incidence of in situ to invasive cancer in women aged 40 to49 compared to women aged 50 to 69 . In previous studies, the MST of PIBC in women aged 40 to 49 ranged from 1.05to 2.46 years [6–8, 13, 20], which is longer than our estimate of 0.95 years. However, this study is thefirst to report MST estimates for women aged 40 to 49 in the UK, and for older women,previous estimates show a shorter MST in British women compared to other Europeancountries . Our estimate of overdiagnosis for annual screening in women aged 40 to 49 in the UK wasin line with those reported in other studies. Hellquist et al. estimated that 1% (-6 to 8) of all breast cancers were overdiagnosed in ascreening programme for women aged 40 to 49 screened every 18 months in Sweden. In asystematic review, the range of overdiagnosis for women aged 40 to 49 years was -4% to7.1% . Despite large credible intervals in our estimates of STS and MST, the rangeof overdiagnosis from this study was small, 0.3% to 2.2% of breast cancers diagnosedwithin ages 40 to 49 years. Thus, although precise estimates of STS and MST are hard toobtain, the estimate of overdiagnosis is relatively unaected. Our sensitivity analysisincluded a large range of STS and MST values, and our results should be generalisable toother countries with similar breast cancer incidence rates as the UK. However, it is notclear to what extent our results are extendable to programmes with longer screeningintervals: the impact of screening frequency on overdiagnosis in women aged 40 to 49years would require further studies. The most important implication of this study is that, in women aged 40 to 49 in the UK,a small proportion of breast cancers were overdiagnosed due to screening, between 0.3%to 2.2% of all breast cancers diagnosed within ages 40 to 49 years. Since women aged 40to 49 have shorter MST, lower STS, and lower mortality rates than women aged 50 andover, less overdiagnosis would normally be expected which may explain why estimates ofoverdiagnosis from this study are smaller than those reported for women aged 50 onwards [2, 3, 23, 24]. Second, although a high proportion of in situ cancers detected atscreening were estimated to be non-progressive, the great majority of these would havepresented clinically in the absence of screening, implying they would not beoverdiagnosed. Finally, the mean sojourn time of preclinical invasive breast cancer,including its in situ precursor, was just under one year, suggesting thatannual screening would be most appropriate for women aged 40 to 49. NBG is supported by the Institute of Cancer Research. MGC is supported byBreakthrough Breast Cancer Research. The Age trial was supported by grants from theMedical Research Council and Cancer Research UK, and also received funding from theDepartment of Health and the US National Cancer Research Institute. NBG participated in the conception and design of the study, the development of themethodology and the interpretation of results, performed the analyses, and drafted themanuscript. MGC participated in the conception of the study, the interpretation ofresults and reviewed the manuscript. SMM participated in the conception and design ofthe study, the acquisition of data, the development of the methodology and theinterpretation of results, revised and reviewed the manuscript, and supervised thestudy. All authors read and approved the final manuscript.